The guitarist LUIS BAPTIS is the author of an original musical project which offers unique shows and records where the diversity of the instruments played by him - 14 different guitars: classical guitar, Portuguese mandolin, Portuguese guitar, Braguesa guitar, Ukulele, Da terra guitar, Beiroa guitar, Toeira guitar, Campaniça guitar, Rajão guitar, Amarantina guitar, Wire strings guitar from Madeira and Terceira guitar from the Azores besides a classical guitar and an electric guitar - and the mix of music styles, from classical, traditional to contemporary, surprises and seduces. Allying Portuguese guitars to classical, traditional and contemporary harmonies, the music of LUIS BAPTIS has no frontiers and is totally original and unique. An innovative and unique musical project accessible to all kind of public, ages and mixed preferences. Unprecedented and surprising, the originality of his concerts and his albums reveal to the international public, in an original and accessible way, and with no complexes, the diversity of a musical and instrumental culture unknown by many. More than valid reasons for LUIS BAPTIS promote his work over borders. 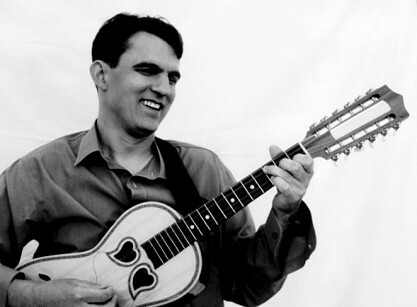 LUIS BAPTIS, was born in Estoril (Portugal) and studied classical guitar, music theory and jazz in Paris. He has played and recorded beside various European musicians.